An original letter of correspondence between brothers and business partners Joshua Coffin Chase and Sydney Octavius Chase. 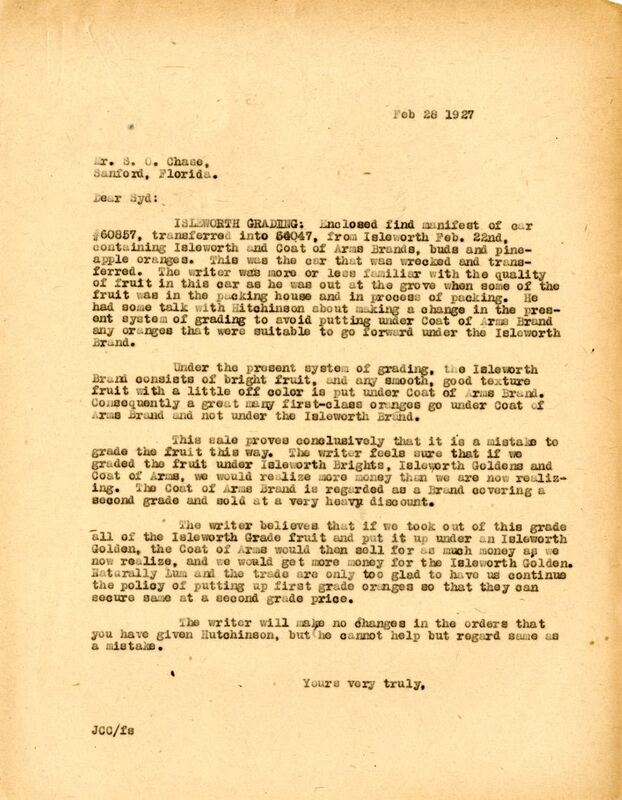 Topics discussed in the letter include the manifest of a wrecked car and the inefficiency of the company's current system of grading fruit at Isleworth Grove. Original letter from Joshua Coffin Chase to Sydney Octavius Chase, February 28, 1927: box 49, folder 20.84, Chase Collection (MS 14), Special and Area Studies Collections, George A. Smathers Libraries, University of Florida, Gainesville, Florida. Digital reproduction of original letter from Joshua Coffin Chase to Sydney Octavius Chase, February 28, 1927. ISLEWORTH GRADING: Enclosed find the manifest of car #60857, transferred into 64047, from Isleworth Feb. 22nd, containing Isleworth and Coat of Arms Brands, buds and pineapple oranges. This was the car that was wrecked and transferred. The writer was more or less familiar with the quality of fruit in this car as he was out at the grove when some of the fruit was in the packing house and in process of packing. He had some talk with Hitchinson about making a change in the present system of grading to avoid putting under Coat of Arms Brand any oranges that were suitable to go forward under the Isleworth Brand. Under the present system of grading, the Isleworth Brand consists of bright fruit, and any smooth, good texture fruit with a little off color is put under Coat of Arms Brand. Consequently a great many first-class oranges go under Coat of Arms Brand and not under the Isleworth Brand. This sale proves conclusively that it is a mistake to grade the fruit this way. The writer feels sure that if we graded the fruit under Isleworth Brights, Isleworth Goldens and Coat of Arms, we would realize more money than we a re now realizing. The Coat of Arms Brand is regarded as a Brand covering a second grade and sold at a very heavy discount. The writer believes that if we took out of this grade all of the Isleworth grade fruit and put it up under an Isleworth Golden, the Coat of Arms would then sell for as much money as we now realize, and we would get more money for the Isleworth Golden. Naturally Lum[?] and the trade are only too glad to have us continue the policy of putting up first grade oranges so that they can secure same at a second grade price. The writer will make no changes in the orders that you have given Hutchinson, but he cannot help but regard same as a mistake. Chase, Joshua Coffin. 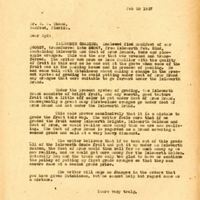 “Letter from Joshua Coffin Chase to Sydney Octavius Chase (February 28, 1927).” RICHES of Central Florida accessed April 26, 2019, https://richesmi.cah.ucf.edu/omeka/items/show/2716.